After the success of TckTckTck, Havas (a global advertising firm) cut out the middleman (that being the NGO), creating their own NGO named One Young World. One Young World could be defined as predatory corporate pedophilia. On the TakingItGlobal website, under the headline How to Mobilize Youth Globally to Support the Goals of the Rio 2012 Summit [the illusory “green” economy], a IYY HLM (INTERNATIONAL YOUTH YEAR – HIGH LEVEL MEETING) RSVP event is described as follows: “The vast networks represented by AVAAZ, Taking IT Global, Peace Child and One Young World represent an excellent way of building on the momentum of the IYY to promote the Rio+20 goals through online media, advertising and PR – and good, old-fashioned campaigning…. The Rio+20 Summit is as good a moment as any to mark that watershed moment: young people – through their schools, their community groups and their online network are well-placed to support the UN and its member states to explain that transition and embed it in the hearts and minds of the general public. This side meeting will raise the profile and importance of the Rio+20 meeting in the minds of all who attend the IYY HLM – and send them home with new skills and new inspiration to support the UN to achieve a stunning success in Rio in June 2012.” Featured speakers included David Jones (founder/director, One Young World; director, Havas Global Advertising) and Jeremy Heimans (founder/board member of AVAAZ.org; director of Purpose Inc.). 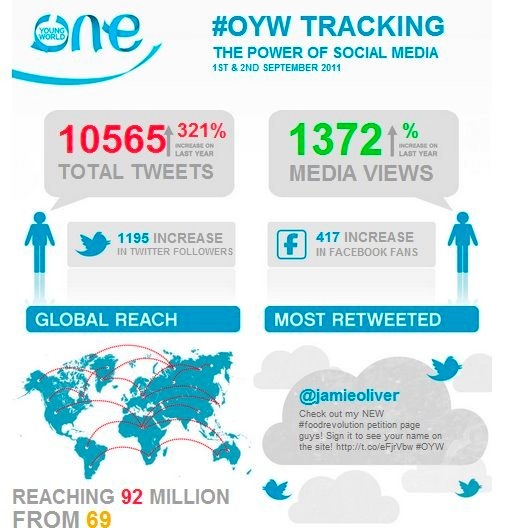 At breakneck speed, One Young World is establishing partner organizations throughout the globe (H. W. Bush is an endorser in the One Young World Pittsburgh org). It has also secured a partnership with Association Internationale des Étudiants en Sciences Économiques et Commerciales (AIESEC); present in over 110 countries and territories and with over 82,000 members, AIESEC is the world’s largest student-run organization. Today, in 2012, with the recent “approved” invasion and annihilation of Libya, which, prior to the NATO-led invasion, had the highest standard of living in Africa, the imperialist states are frothing at the mouth over the prospects of invading/ occupying Syria under the carefully orchestrated guise of “humanitarian intervention.” The imperialists steal and plunder every last drop of wealth from resource-rich countries – both monetary and cultural, as well as ecological. Of equal importance to the imperialists is protection of the decaying US dollar and Euro and keeping resource-rich countries poor via debt. (Case in point: Libya had no debt. Further, Gaddafi was working toward the introduction of the gold dinar, a single African currency, made by gold, which was to be a “true sharing of the wealth” for the African people that would have resulted in their oil no longer being traded in American or Euro currency, thus liberating them, to some extent, from the chains of imperialism.) If one looks closely, we can witness a steady transformation, well underway within the meticulously maintained, well-greased gears of the propaganda machine – a machine that continues to be refined. The blurring of lines between corporate power, the corporate media complex, the non-profit industrial complex, and the United Nations continues to accelerate, while simultaneously the veil begins to lift. “The CIA’s political influence operations around the world are also being exposed every day. Run in tandem with international financier George Soros and his network of non-governmental organizations (NGOs) and not-for-profit foundations, the CIA’s attempts to foment rebellions through ‘themed revolutions’ and election engineering are becoming better understood, ironically through the media that Soros and the CIA champion the most – social networking. From the streets of Egypt and Syria, where the CIA’s and Soros’s involvement in artificially-created uprisings is no longer a secret, to Russia, Venezuela, Belarus, and China, where political intervention by the CIA and its team of Soros ‘do-gooders’ is now being met with strong opposition, the cat is out of the bag. The Open Society Institute (renamed in 2011 to Open Society Foundations) is a private operating and grantmaking foundation founded by George Soros, who remains the chair. Soros is known best as a multibillionaire currency speculator who became known as “the man who broke the bank of England” when he gained one billion (US) in investment profits in a single day on September 16, 1992. Soros is a former member of the Board of Directors of the Council on Foreign Relations (CFR), created in 1924 by the Rockefeller and Carnegie foundations. The CFR is essentially the promotional arm of the ruling elite in the US with most all US policy initiated and written by the exclusive membership within the CFR. Soros has deep ties to the Trilateral Commission, which is the international counterpart of the CFR created in 1973 by David Rockefeller, Zbigniew Brzezinski (who worked with CIA operant Gloria Steinman) and McGeorge Bundy. Soros also is privy to the exclusive Bilderberg Group, which functions behind closed doors. The Bilderberg Group is an offshoot of the CFR, founded by David Rockefeller; Dean Rusk, former head of Rockefeller Foundation; Joseph Johnson, head of Carnegie Endowment; John J. McCloy, Ford Foundation Chair, and some notables of the European oligarchy. Most revealing, Soros is an avid supporter of Occupy Wall Street. The following text contains factual information/evidence obtained from many months of research that undoubtedly will be met with much hostility and resentment by many. Yet, analyzing such information is critical if we are to see the light through our veils and illusions. As only then does the possibility for a real influence and positive outcome arise from orchestrated events that are being engineered with a false exterior to serve corporate and imperialist interests. The very forces we claim to oppose continue to successfully reabsorb us into the very system destroying us – the very system we must starve, struggle against and ultimately dismantle. This is where we fail. If we continue to deny these truths rather than confront them, our collective denial will serve as the instrument for securing our own annihilation. This is NOT TO SAY that there are not legitimate Occupy Wall Street (OWS) sects that have broken off from the core, neoliberal-funded and dominated OWS reform movement. A reconnaissance of corporate funding (via foundations), coupled with a rock solid understanding of history, is vital. The understanding of how our movements have been financed, designed and controlled by the forces we seek to oppose, of the very sequence of events that has led society to the present moment, is vital if we are to transcend the barbed wire barriers that keep us enslaved within the system. From 2011-Year of the Dupe: February 17, 2011: “The London-based National Front for the Salvation of Libya (NFSL) calls for a Libyan “Day of Rage” [note the hijacked term from the real revolutionary Weather Underground movement] to match the US-destabilization rhetoric used in Tunisia and Egypt. The NFSL has been backed by the CIA-MI6 since the 80’s and had made multiple attempts to overthrow Qaddafi’s government with both terrorist attacks and armed insurrection. 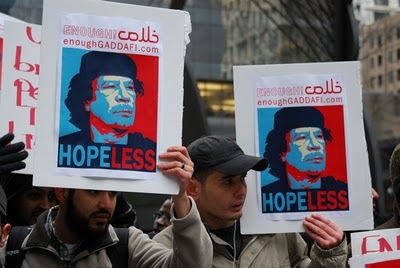 Note the “EnoughGaddafi.com” signs. EnoughGaddafi.com’s webmaster is listed on the US State Department’s Movements.org as the “Twitter” to follow. “A number of the groups and individuals directly involved in the revolts and reforms sweeping the region, including the April 6 Youth Movement in Egypt, the Bahrain Center for Human Rights and grass-roots activists like Entsar Qadhi, a youth leader in Yemen, received training and financing from groups like the International Republican Institute, the National Democratic Institute and Freedom House, a nonprofit human rights organization based in Washington. “The article would also add, regarding the US National Endowment for Democracy (NED): “The Republican and Democratic institutes are loosely affiliated with the Republican and Democratic Parties. They were created by Congress and are financed through the National Endowment for Democracy, which was set up in 1983 to channel grants for promoting democracy in developing nations. The National Endowment receives about $100 million annually from Congress. Freedom House also gets the bulk of its money from the American government, mainly from the State Department. “It is hardly a speculative theory then, that the uprisings were part of an immense geopolitical campaign conceived in the West and carried out through its proxies with the assistance of disingenuous foundations, organizations, and the stable of NGOs they maintain throughout the world. As we will see, preparations for the “Arab Spring” and the global campaign that is now encroaching on both Russia and China, as predicted in February 2011’s “The Middle East & then the World,” began not as unrest had already begun, but years before the first “fist” was raised, and within seminar rooms in D.C. and New York, US-funded training facilities in Serbia, and camps held in neighboring countries, not within the Arab World itself. 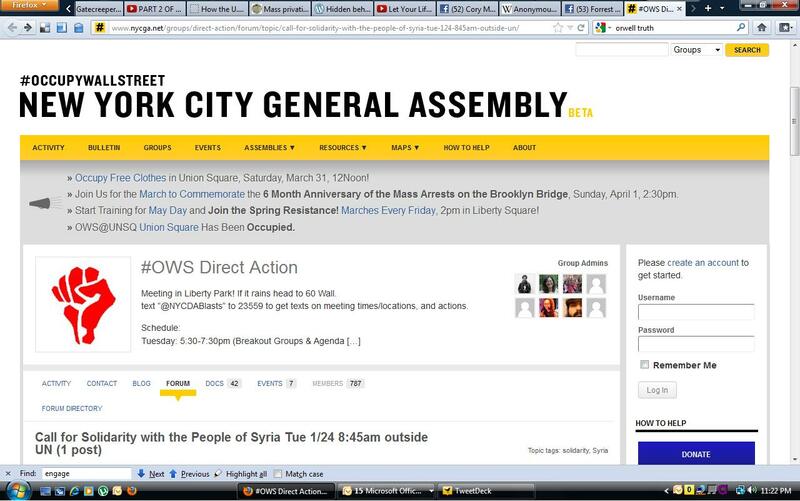 “December 3-5, 2008: Egyptian activists from the now infamous April 6 movement were in New York City for the inaugural Alliance of Youth Movements (AYM) summit, also known as Movements.org. There, they received training, networking opportunities, and support from AYM’s various corporate and US governmental sponsors, including the US State Department itself. The AYM 2008 summit report (page 3 of .pdf) states that the Under Secretary of State for Public Diplomacy and Public Affairs, James Glassman, attended, as did Jared Cohen who sits on the policy planning staff of the Office of the Secretary of State. Six other State Department staff members and advisers would also attend the summit along with an immense list of corporate, media, and institutional representatives. Above screenshot: Occupy Wall Street Screenshot featuring an Avaaz destabilization campaign against the Syrian Government. Note the red Otpor logo (fist). 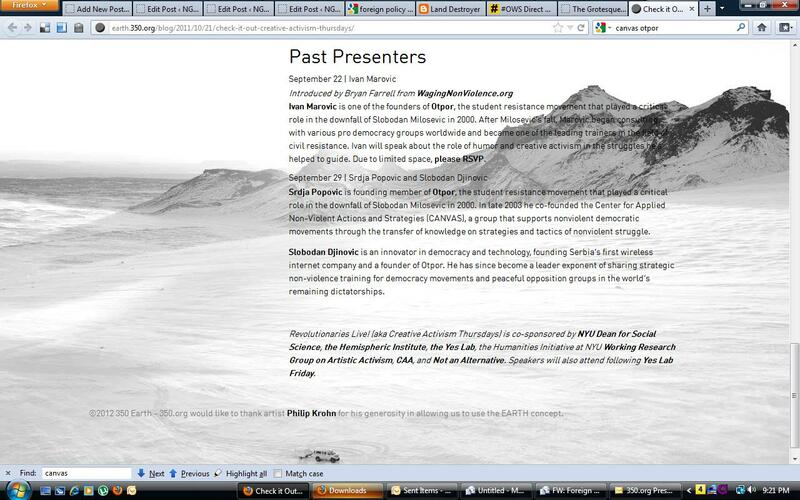 Above screenshot: Earth.350.org.blog: Leading up to the 15 October 2011 Occupy movement, Rockefellers 350.org’s past presenters include Ivan Marovic, founder of US-funded Otpor (22 September2011), Srdja Popovic founding member of Otpor and Slobodan Dinovic, one of Otpor’s original organizers (29 September 29 2011). Like the Egyptian “Revolution,” the change in venue and transition of key players we witness today has been anything but spontaneous. And although it is tragic that most of the entire globe has been conned, far worse is the fact that global society as a whole, with “the left” movement at the forefront, continues to swallow and perpetuate the lies that the continued “uprisings” of the countries targeted for destabilization are spontaneous revolutions. The logic being, if the revolutions were spontaneous uprisings, then the Occupy movement was also spontaneous; arising from the people, not orchestrated by the ruling classes. “The left,” in an act of insanity and denial, has committed itself to supporting what the ruling classes, via corporate media and a network of Soros-funded NGOs, have framed as “revolutionaries” in sovereign states under strategic invasion, while in reality, these so-called revolutionaries are foreign-backed insurgents/terrorists, including the CIA-created Al-Qaeda terrorist cell, which the US now acknowledges publicly as having partnered with. The “progressive left,” in order to save face, has sided with the 1% they claim to oppose – millions, no doubt, unwittingly. Well-intentioned citizens who believe themselves to be progressive in their ideologies, who believe they are of sound intelligence, continue to cling to this position as volumes of evidence dispels all myths of Gaddafi having turned on his own people. If tens of thousands must die in order for the “left” EuroAmericans to feel good about themselves, then so be it. No one wants to be the dupe. The oligarchy understood this unequivocally. And while Occupy preached the virtues of non-violent direct action, the imperialist countries advanced their destabilizations, invasions and occupations in the Middle East and Africa at an unparalleled speed – murdering, some estimate, as many as 100,000 Libyans in the process. The silence of dissent was deafening. Very few of us have despaired at our complicity; most people simply turn a blind eye to the truth so they don’t have to feel bad about their coffee shop assent. The Occupy Wall Street “movement” website www.15October.net was registered and paid for on 12 July 2011 by Paulina Arcos, spouse of Francisco Carrión Mena, the Permanent Representative of Ecuador to the United Nations. Santiago Carrión’s associate, Pedro Noel, is a Brazilian Internet media activist known in the Romanian media as “the man who made 700 thousand Spaniards take the streets.” In 2011, along with other internet activists, researchers and volunteers, Pedro Noel started the project The Global Square in partnership with Delft University of Technology and its project Tribler. Roarmag.org website lists the founders of The Global Square as volunteers of the following organizations: Take the Square, United for Global Change, 15october.net, European Revolution, and Reflections on a Revolution (ROAR). Note that all of these organizations are founded by or affiliated with Carrión. On 5 November 2011 at 10:04pm, WikiLeaks tweeted: “The Global Square: an online platform for our movement,” citing the link: http://wlcentral.org/node/2328. In truth, we have approximately 2 people, openly identifiable (who, until recently worked in complete anonymity), at the helm of designing and shaping the entire global occupy “movement” into the ultimate platform for the accumulation, coordination and dissemination of information. A platform “where people of all nations can come together as equals to participate in the coordination of collective actions and the formulation of common goals and aspirations” (bold emphasis added). With a massive throng of WikiLeaks supporters that has only grown stronger with the attack on WikiLeaks founder, Julian Assange, is there anyone, in any spectrum of the left, who won’t trust Carrión’s, Noel’s and Wikipedia’s Global Square project? While steadfastly upholding lost values with which the left wishes to be associated, Assange has been vilified by the very forces that the left opposes. Thus, Assange has embodied impenetrable hero, if not martyr, status. Could this be the most brilliant psyops ever conducted via internet technology, utilizing the world’s leading technocrats and global social media – or has WikiLeaks simply been infiltrated? Will the Global Square serve to be the ultimate coup de grâce on a society both manipulated and intoxicated by the non-profit industrial complex? Interestingly, this infrastructure very much follows the strategy behind the Climate Action Network (CAN), co-founded by Michael Oppenheimer (Environmental Defense Fund) in 1988, which successfully reigned in and presided over a global network of environmental organizations, thus ensuring that no movement would ever threaten economic growth. Occupy/15M, now transcending into The Global Square, is quickly being established as the official clearinghouse for all dissent, direction, communication – and as the global technological superpower for social engineering, soft power destabilizations and a cooling mechanism to keep the public passive and controlled. One major theme within all of the aforementioned organizations has been the persistent framing of imperialist destabilizations as revolutions and uprisings, prior to and during the unprovoked annihilation of Libya, and the heavily financed destabilization now well underway in Syria. [Case in point: On 15 June 2012, Take the Square posts the article Syria Sectarian Divide Takes Alarming Turn, which states: “A perpetual and repugnant war is likely to replace the collective aspirations for equality, freedom and democracy that fuelled the non-violent uprising nearly 15 months ago.”] The demonization of Gaddafi, Assad, and other governments of sovereign, resource-rich states in Africa, the Middle East and Latin America, has been key, thus mirroring and amplifying the very sentiments put forward by the US State Department. On the WikiLeaks Central website we find several Avaaz petitions. Most striking are the headlines: Stop the Massacre – Save the Libyans and To the UN Security Council, both posted on 03/22/2011. The second highlighted the Avaaz petition demanding a no-fly zone be imposed on Libya. Carrión and Noel perhaps should be considered the Marovic, Popovic (Otpor/Canvas) adaptation for Europe. Whether Santiago Carrión’s and Pedro Noel’s intentions (along with many others) were or are sincere, whether they are naive patsies or CIA operatives – matters little. The global Occupy movement was the psyops needed, and brilliantly executed, that would build a cohesion of silence within the left against the deliberate destabilization of the Middle East and Africa. For the “revolutionaries” cannot be wrong. The “revolutionaries” are united as one. To admit that the revolutions were strategically set into motion and financed by the ruling plutocrats is to admit we’ve been co-opted by the very forces we seek to oppose – yet again. And as Avaaz coordinated the OWS live stream in 2011, perhaps one single tweet is the most revealing of all. It would be a mistake to dismiss the possibility of the CIA working in tandem with or within the United Nations (Carrión) or WikiLeaks when it has been documented that Kofi Annan, the United Nations “Peacekeeper” was handpicked by the CIA (30 March 2012, Kofi Annan: black skin, white mask]. Consider that in June 2011 LulzSec claimed responsibility for an attack on both the FBI and CIA websites. Flash forward to March 2012 to find that the leader of the hacker group LulzSec (affiliated with Anonymous) was exposed as an FBI operant. The iNEWP – Freedom of Speech (formed in 2010) is yet another new highly suspect “news media” outlet where one can find highlighted a recent Avaaz destabilization campaign against the Morales (MAS) government of Bolivia. It lists its affiliates as Anonymous, The Occupy Movement (note the red Otpor/Canvas fist above the featured Avaaz campaign in the screenshot prior), The Sun Maker, TesfaNews, and VVVPR (VVV Public Relations: BPR + Guerrilla Marketing). This once very public information (accessed 30 March 2012) has since been removed from the iNEWP website. One must wonder how an organization such as iNEWP – Freedom of Speech solidifies and retains a partnership with an Anonymous group (that being Anonymous), and how the Occupy Movement has partnered with this organization without a democratic vote of its occupiers, considering the Occupy Movement claims there are no leaders. One may also question why iNEWP – Freedom of Speech uses a (web) domain privacy service that protects the registered owner’s private information, offers first names only of their international staff, and purposely neglects to offer any information as to who they are funded by. Further, one must ask oneself exactly if any entity within or outside of the Occupy Movement is paying VVV Public Relations for their services. There is one item of interest disclosed in the domain registration of iNEWP and that is the address listed as 666 NY, New York. This should be considered an inside joke whereby they are mocking the masses. They are playing with us. And where consumerism made the plutocrats monetarily rich in the 20th century, the 21st century riches will flow from privatized security. One can safely assume the Occupy Movement (promoted heavily by the Democratic Party and the Rockefeller/Soros NGOs such as MoveOn – sister organization of Avaaz) will assist in advancing “the imperative” to expand privatized security [See Council on Foreign Relations: Armies Without States: The Privatization of Security]and the “need” to override civil liberties and freedoms by introducing fascist censorship and legislation; the most recent example being martial law itself in the U.S. The plans that we witness being unveiled today are years, if not decades, in the making. Nothing is left to chance. In Europe we find the “revolutionary movement” 15M who identifies itself as “global Occupy/15M movements.” They are heavily promoted by a slew of NGOs from the Soros network (one being that of Global Voices, whose sponsors include the Ford Foundation and the Soros Open Society Institute) to Take the Square, whose partners include US Day of Rage (this terminology was discussed earlier in this report; it is terminology we continue to witness, as in Libya, being co-opted by NGOs funded by globalists). US Day of Rage (a finance reform organization founded by Alexa O’Brien that seeks to distract by directing their followers to believe in the US electorate, marketing the phrase One citizen. One dollar. One vote. O’Brien also is identified as a founder of Occupy Wall Street by Wired as well as a reporter for WikiLeaks Central.) US Day of Rage lists its partners, all promoting 15M, as: EuroRevolution (over 30,000 Facebook followers), Anonymous (over 300,000 twitter followers, and whose logo bears uncanny resemblance to the logo shared by the United Nations), Roar Mag, WikiLeaks Central, and Take the Square – all founded by and/or affiliated with (with the probable exception of Anonymous, whose primary focus is the highlighting/promotion of #OWS) Santiago Carrión. It is worth noting that the movement is also referred to as the Spanish Revolution. The creator of this web platform is none other than Chris Moya, software developer and author for the Soros Global Voices network. And where did the 15M movement originate? Was the 15M campaign also founded in part by Santiago Carrión, or as in many cases, was this simply a case of co-opting a legitimate concept from near inception in order to corral it, thus absorbing it into the NGO matrix where it can be controlled. The following facts speak volumes. 15M.cc was launched in September of 2011 with the intent not to represent the movement but rather to serve as the umbrella for data/history/projects organized (past, present and future) on behalf of the 15 May 2011 mass demonstration/movement organized by Democracia real YA! (Real Democracy NOW! or DRY!). It is publicly stated that there are 3 key people behind the 15M.cc initiative: an entrepreneur/developer and self-described “founding father” of P2P (peer to peer) social networking (Pablo Soto), a filmmaker (Stéphane M. Grueso) and an expert in marketing, design and journalism (Patricia Horrillo). “The #spanishrevoution is an internet movement that was started by leading figures on the internet, including top bloggers and internet entrepreneurs, to harness the distress of the Spanish people into action ahead of this past weekend’s elections. Some of the most important figures/initiators of the 15M movement are Fabio Gándara (who has been part of the movement since the beginning), Jon Aguirre Such (DRY’s spokesperson) and Olmo Gálvez (whom El País calls a social networking “crack”). It’s interesting to point out that all three of them are quite young, between 26 and 30, and didn’t know each other until shortly before 15M…. The founding Change.org team of advisors include Darren Haas, developer of financial trading and currency exchange software with Euronet Worldwide; Sundeep Ahuja, founder/product manager/marketing/strategy advisor/investor/co-founder/president at blissmo, Kiva.org, indiegogo, DailyFeats, Sparked.com, richrelevance, friendput, MySpace, and an actor, to boot; and Joe Greenstein, software developer and co-founder and CEO of Flixster. Change.org is a member of George Soros’s Media Consortium. Change.org is subtle yet clear in their affiliations. Ample media coverage provided by Media Consortium partners and social media/tech sites, etc. Change.org seldom fails to mention the other effective organizations – Avaaz.org, Sumofus.org, and 38degrees.org.uk. Change.org is the darling of corporate media powerhouse TIME magazine, which having named change.org founder Ben Rattray, as one of TIME’s, 100 Most Influential People of 2012 while profiling of Olmo Gálvez in TIME Magazine’s 2011 Person of the Year – The Protestor. Goodman (of Democracy Now!) describes Gálvez as “a young entrepreneur with experience in several countries….” Such corporate-controlled entities lend credibility and legitimacy to “leaders,” movements and ideologies that secure and protect corporate power. Such well-greased mechanisms are essential in establishing a collective consent to the hegemony of the ruling oligarchy. Other recent instances of corporate-sponsored NGO “leaders” that have been praised by the likes of TIME and foundation-funded “progressive” media include “green” capitalist Al Gore, who is also deemed by TIME as one of the 100 Most Influential, while Rockefeller’s lovechild Bill McKibben seems to have taken up symbolic residence at the studio of Democracy Now! In a patriarchal society, charismatic fellows such as Gore and McKibben are key members of a manufactured, managerial elite, building global public acceptance for the illusory green economy – formerly known as industrialized capitalism – the goal being to protect capitalism, thereby protecting the current structures at all costs, by any means necessary, by every means available. “This was a crucial night for the protestors calling themselves ‘indignados,’ who had descended upon Puerta del Sol on May 15 intent on staying until national elections in Spain. Frustrated with a political system they feel does not work for them, many of them out of work, they stayed to protest in defiance of a national law that prohibits discussion of electoral politics so close to the elections. But it was also a crucial night for Actuable, an online petitions platform then just a few months old. Protesters wanted to tell Spanish elections authority, the Junta Electoral Central, that they had a right to be heard. While they rallied in Madrid despite the electoral rules, they also went online – to Actuable, where a petition asserting their right to demonstrate, even immediately before an election, collected 200,000 signatures…. “Actuable co-founder Francisco Polo told techPresident in a recent interview. ‘It was an unprecedented way to empower people.’ It’s hard to know what impact the petition actually had, but the chance to see use by the indignados was a moment in the sun for Actuable. Founded last year, Actuable was always intended to operate in the style of Change.org – which recently acquired the Madrid-based platform. Now it is a new international presence for Change.org, and part of the company’s new plans to expand globally…. “Polo is now director of Change.org Spain, and Actuable will be rebranded with Change.org’s colors over the next few months…. “A company spokesman says that the two platforms will be completely merged by 2012, with languages and campaigns localized for each visitor. Actuable’s 720,000-some-odd members will be rolled into Change.org’s user base, which already grows – or so the company claims – by about 400,000 users a month. Principles before Party – US Day of Rage will never endorse, finance, or lend our name to any candidate or party. Volunteer – Every US Day of Rage organizational committee on the state, city, and federal level should be entirely self-supporting, declining outside contributions from any political party, association, or candidate. US Day of Rage is not a money making operation. We are volunteers. Autonomous Except in Matters Affecting the Whole – We do not support, for example, violations to our principle of non-violence. USDayofRage.org is here to help facilitate city and state level organization, and to organize the federal protest at the US Capitol.